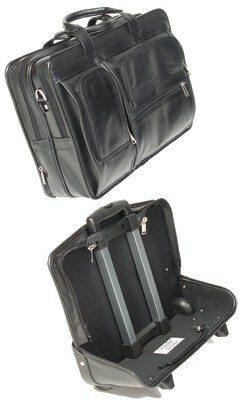 The Lowest Priced Leather Bag with Mcklein's Patented Removable Wheel and Handle System. 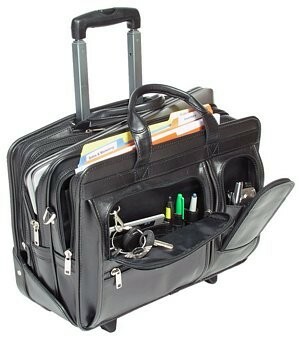 Just try to find a wheeled business case that does all of this at this price! 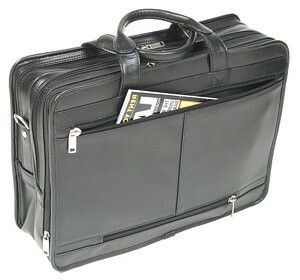 Here's a laptop case that can double as a briefcase. The Clinton has detachable wheels make it easy to transport whatever you need without pain or strain...carry the case without wheels or get rolling with the patented wheel system. The McKlein Clinton laptop case! Features organizer section for, PDA, cell phone, pens, business cards, etc., and front zipper pocket for small, miscellaneous items. Dimensions Exterior:16” x 6.5” x 13” ; interior: 15" x 2.5" x 10.5"
Weight with frame: 7.2 lbs., weight without frame: 3.2 lbs.